You can have a modern focal point to your bedroom decor with this upholstered bed. The piece carries a dark brown faux-leather upholstery, which generates a luxurious look that is easy to love. 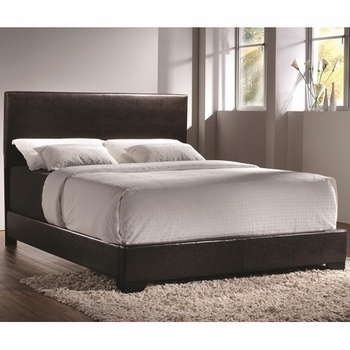 In addition, the high straight headboard, bracket feet and low profile-styled footboard frame add to the overall contemporary spin. Simple, yet, stunning, this bed is bound to leave a memorable impression in your bedroom setting. Box spring required.